Death Toll In London Rampage Rises To 8 After Body Pulled From River : The Two-Way Though police haven't formally identified the victim, they're seeking information on Xavier Thomas, who has been missing since Saturday's attack. Officials say 10 people remain in critical condition. 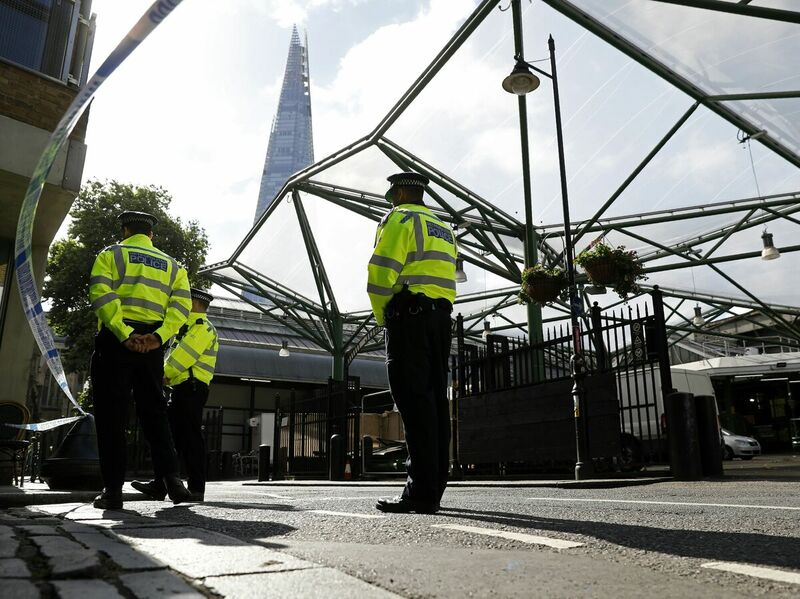 Police officers stand guard in London on Wednesday, after the security cordon was reduced. British police say they found an eighth victim of Saturday's attack. The death toll from Saturday's terrorist attack in London has risen to eight, the city's Metropolitan Police said Wednesday. The announcement comes shortly after authorities recovered a body from the Thames River in east London. In a statement about the recovery of the body Tuesday, police said they haven't formally identified the victim — though they asked for information about 45-year-old Xavier Thomas, a French national who has been missing since Saturday. The BBC reports that Thomas was last seen on London Bridge walking with his girlfriend, who was seriously injured in the violence. As the Two-Way has reported, three attackers opened their assault on London Bridge by ramming pedestrians, then left the vehicle on foot and began stabbing people in nearby Borough Market. Police shot and killed all three. NHS England, the British health authority, said Wednesday that of the dozens of victims hospitalized after the attack, 10 people remain in critical condition. Meanwhile, the Spanish government has confirmed that Ignacio Echeverría, 39, was killed in Saturday's attack. Officials there had been upset at how long it took U.K. authorities to offer information on the Spanish national, who had been missing since the rampage. "We're pushing the British authorities because, frankly, this isn't the kind of thing that can go on and on," Spanish Foreign Minister Alfonso Dastis told the news agency Efe earlier in the week, according to The Guardian. "Echeverría, who is from Madrid but lives in London and works for HSBC, has been hailed as a hero for apparently using his skateboard to take on the London Bridge attackers. "He is thought to have been skateboarding in a park when he stopped to defend a woman who had been injured in the attack near Borough Market. Friends who were with him at the time said he fell to the ground after confronting one of the assailants. He has not been heard from since." Echeverría has been hailed as a hero in Spain, where Prime Minister Mariano Rajoy tweeted he will be remembered "for his heroic and exemplary act." Of the eight people killed, British authorities have publicly identified two other individuals, both Australian nationals: Kirsty Boden, as confirmed Tuesday by NHS England, and Sara Zelenak, as confirmed Wednesday by police. The Guardian has a report on several other victims who have been identified by family members. Meanwhile, London police have taken down much of the security cordon they initially placed around the crime scene, leaving only Borough Market and some areas nearby still closed. The visible police presence remains, however — as does the memory of the attack in the minds of British voters, just one day before the country undertakes its national elections. And, as NPR's Frank Langfitt reports, that means the issue of security promises to loom large for voters as they decide whether to bolster or erode Prime Minister Theresa May's base of support in Parliament.